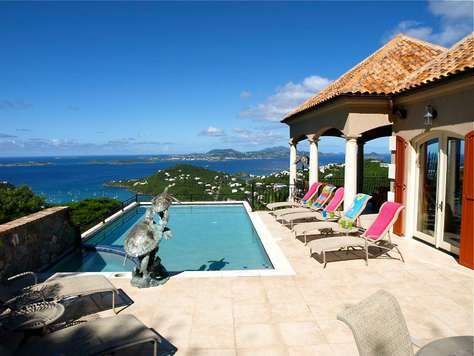 Casa Mare is a wonderful new villa in Chocolate Hole on St. John. A striking modern design with a beautiful view into Hart Bay. 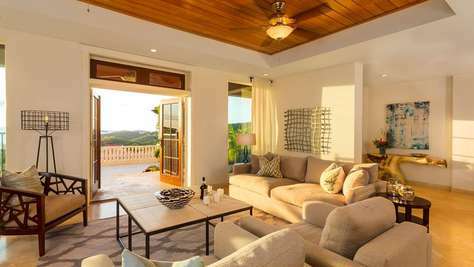 This villa, just minutes from Cruz Bay and the National Park beaches has over 5000 sq ft of relaxing space and first class ameneties. With views of St Thomas and the blues of the Caribbean sea, Casa Mare is the perfect home for both families and groups of friend. Lush landscaping surrounds the home and provides privacy for your group. The pool deck, outdoor dining and pool is the perfect spot for entertaining or lounging in your own private oasis. The bedrooms all have sleek yet comfortable modern furniture, spa like baths with stunning views, and TV with Dish network. All bedrooms have independant central air. The gormet kitchen with top applicances gives plenty of room to prepare dinner for the whole house with all of the comforts of home are available. 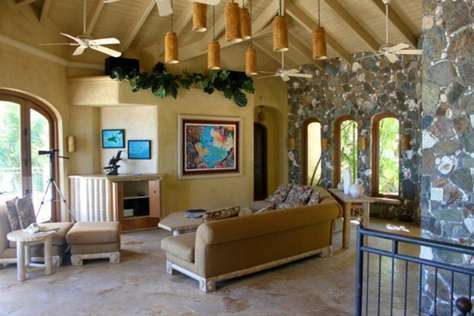 The living area and sitting areas around the villa are comfortable and spacious. 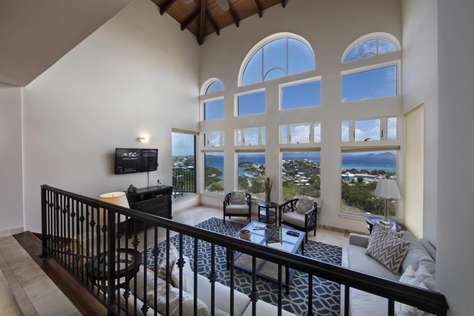 Breathtaking views of Hart Bay and Chocolate Hole, Great Expectations houses 4 air-conditioned Master Suites, our Club Room and a large Great Room. The Great Room includes a gourmet kitchen, dining area, and a generous sitting area for relaxing, enjoying media, or just taking in the views. Just a short walk from the Main Villa is The Guest House which offers 3 additional bedrooms. Great Expectations also offers 3 pools, 2 hot tubs, a regulation sized tennis court and basketball court just steps away for the living area! With 55 solar energy panels and 5 Tesla Powerwalls (for nighttime and power backup), Great Expectations is a GREEN VILLA that can operate off-grid even when the island power is out! 4 equal Master Suites, each with private full bath, double vanities, indoor/outdoor showers, cathedral ceilings, custom Balinese teaks. 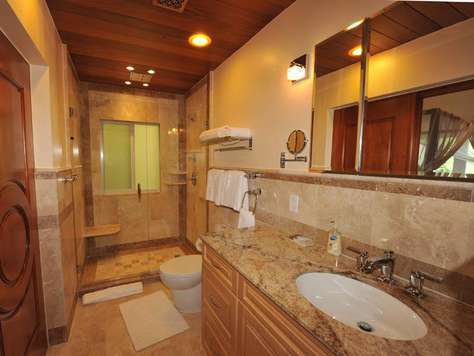 Each of these suites has a private full bath with double vanities plus indoor/outdoor showers. Their classic cathedral ceilings, skylights, transoms, soft lighting make for a spacious feel. Custom teak furnishings from Bali bring the exotic flair. Bedrooms are roomy enough to accommodate an airbed or crib for baby. This family-friendly property includes all 4 of these masters on the same level in two pavilions with the Great Room (living room, gourmet kitchen and both indoor and alfresco dining) in a third pavilion between them. The Club Room, below 2 of the bedrooms, has Twin trundle bed setup (2 twins) and its own bathroom. Note: SATURDAY-TO-SATURDAY or SUNDAY-to-SUNDAY RENTALS ONLY (except for rentals during September and October). Please inquire about larger parties with additional children. More than 16 people may be accommodated for $500 per person per week; please inquire! No charge for children age 2 or younger who are staying in the same room as their parent. •	Graco Pack 'n' Play cribs, high chairs, infant bath tub, baby and toddler beach cabanas. •	Jacuzzi pool (10' x 20' x 5' deep), + hot tub. All have Chemical-free filtering system. Main Villa interior: 3,400 + exterior: 3,600. Guest House interior: 1,400 + exterior: 1,100 sq. 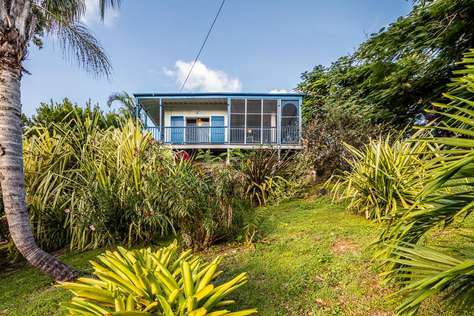 ft.
Set on an an acre of Caribbean paradise, Mooncottage is quite private, fully screened, and surrounded by fruit trees. The two pavilions that make up Moon Cottage are crafted in native stone bordered and by a graveled courtyard garden with a koi pond. A heated pool and next to the covered verandah showcase amazing ocean views.. The main pavilion is tastefully decorated with upholstered sofas and chairs with teak and other exotic hardwood accents. There you will also find a fully stocked kitchen and a full bath. A queen bed completes the restful feel of this pavilion, with a shaded porch just outside. Next door is the master bedroom pavilion, complete with an outside shower, queen bed and full bath. Mooncottage offers many excellent amenities, including satellite wireless internet , and a complimentary welcome basket of provisions and special gifts for all guests. If you are feeling like a day or night away from the villa, it is only a short drive down to Coral Bay where you will find a few cozy bars, some great restaurants, and white sand beaches. Few places on St John, USVI conjure such relaxation, or offer such ub-obstructed views as does Bordeaux Mountain. 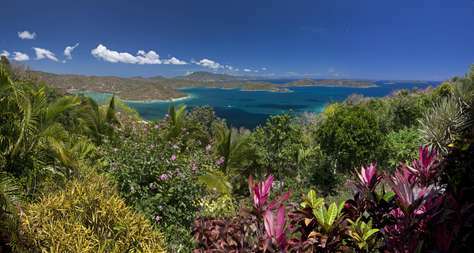 In fact, the view from Bordeaux Mountain, St John has consistently been named one of the Ten Best Views in the Caribbean. 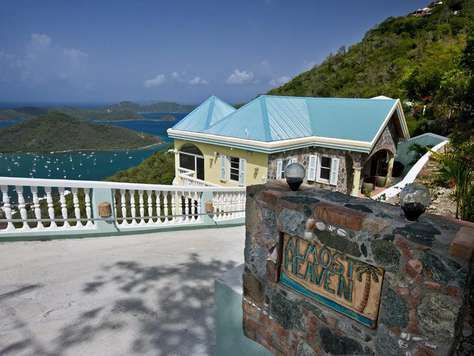 Situated high above panoramic views of Coral Bay, Drakes Passage, and the British Virgin Islands, is this lovely centerpiece of relaxation and vacation splendor. Almost Heaven. With twenty eight hundred square feet masterfully designed of stone, tile, mahogany and Caribbean furnishings, Almost Heaven offers one king and two queen bedrooms, each with private baths and sleeps up to eight people, when two are children under the age of twelve. A full gourmet kitchen with granite counter tops, stainless steel appliances and all the ecoutremont your group will need for home cooked cuisine. The outdoor area is accentuated by a forty five foot lap pool, comfortable lounging on a screened outdoor deck, outdoor grilling area, a jacuzzi for six persons, and of course views views and views. A trip to St John USVI, is not complete without a visit to the National Park, Coral Bay, the North Shore Beaches, Salt Pond and of course the many hiking trails, and Almost Heaven sits right in the middle of the map, making it easy to access the entire island of St John from one central location situated on the highest point on the island. Book early as Almost Heaven is a poplular return destination and we look forward to welcomming you! 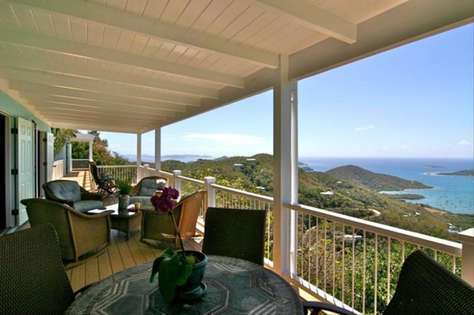 Centrally Located on St John for Quick Access to All Points. Cherry wood and Caribbean Themed Furnishings. Forty Two Inch Flat Screen Television. Absolutely magnificent in every way! 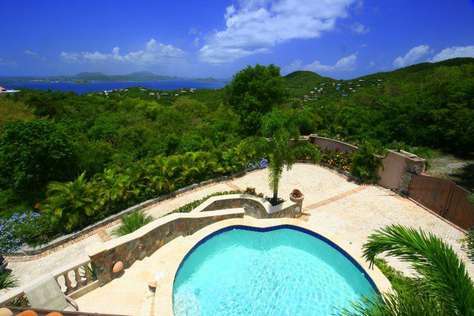 Lushly landscaped grounds surround this very secluded two-bedroom luxury home, bordered by pristine Virgin Islands National Park lands, but conveniently just a few minutes drive to Cruz Bay. Isla Vista features a spacious two-level floor plan with stunning custom interiors, expanded by dramatic island views stretching to the horizon. Rather you're planning a romantic getaway, a family renunion, a couples retreat, or a group team building vacation; you will find that there is good reason for the high number of repeat guests at 2B Peter Bay. 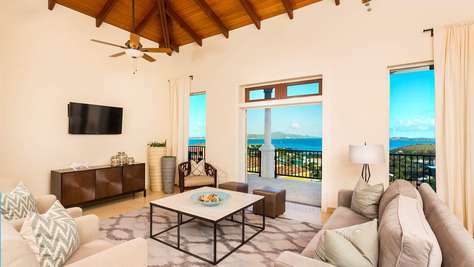 With four bedroom suites and four and half baths, expansive common area and dining space all just a short stones throw away from the majesty of the Caribbean, you will more than likely never leave the villa. The property and villa design is uniquely suited for togetherness, or solitude, as carefully terraced levels, native stone paths and individual patios offer each person or couple all they could ever dream of in a Caribbean vacation; un-obstructed ocean views, the sound of caribbean waves gently crashing upon the shore, private beach access. Anniversary Point is a breathtaking viewpoint discovered and designated by 2B Peter Bay's owners while celebrating their twenty-fifth wedding anniversary, and along with every other majestic detail of this beautiful island treasure, will not disappoint. Indeed there is good reason for booking your treasured vacation with us at 2B Peter Bay, and we look forward to exceeding your expectations. 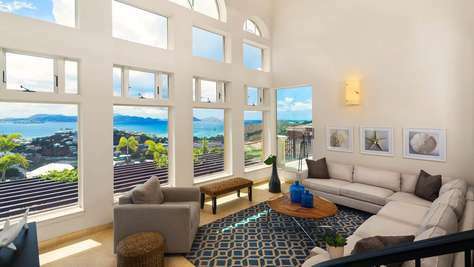 Delfina is an ultra-luxury estate located in the exclusive Peter Bay gated community of St. John, United States Virgin Islands. 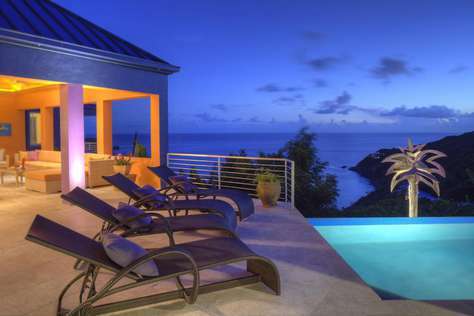 Enjoy the stunning panoramic turquoise blue ocean views and close by British Virgin Islands. 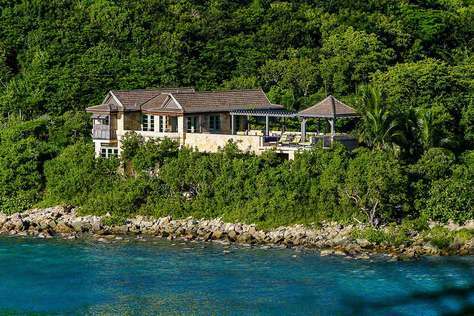 This Caribbean villa is one of the few exclusive homes with private beach access nestled between Trunk and Cinnamon Bay. The Peter Bay reef - a snorkeler's best kept secret - is only a short swim away and is home to a wide variety of stunning fish and coral. 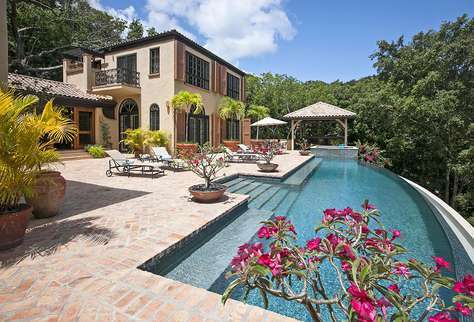 This unique home is beautifully decorated in traditional West Indian style furnishings. It offers over 11,000 square feet of interior living space and furnished terraces. Villa Delfina is the ideal destination for anyone looking for a deluxe St. John villa rental in one of the island's most exclusive areas. On the main level, luxurious sitting and dining areas open through sliding glass doors (that disappear into the wall) to the patio, allowing guests to enjoy indoor/outdoor living. A beautiful, formal dining room seats 12 and connects to the gourmet kitchen and, through a pair of screened French doors, the barbecue and additional outdoor dining area. This level also has an alcove with small desk and high-speed Internet access. The villa can host up to 10 guests - or 14 if children share the lower bedroom (additional fee applies). Five bedroom suites, each equipped with TV, mini-fridge, coffeemaker, iPod docking station, en suite bathroom, outdoor shower and private balcony, all offer beautiful ocean views. The 6th room has two sleep sofas located in the game room off of the entertainment area, lower level. Maid service is provided three times a week. The villa is also fully air-conditioned and equipped with many amenities. Guests can spend an entertaining day outdoors in a tropical paradise, sunbathing, cooling off in the swimming pool, enjoying the spa tub, lounging in the garden hammock, relaxing in the shaded section of the outside patio or indoors playing pool, pinball, darts and watching movies. The terraces and wet bar are great for cocktail parties and the chef-equipped kitchen is perfect for entertaining or catering. This villa is charming and romantic enough for honeymooners, yet with spacious living and bedroom quarters located apart from the main living area, the villa is equally suited to small corporate retreats or fun family vacations. Villa Delfina provides five luxurious bedroom suites, all with outdoor shower, coffee/beverage mini-bar, robes, hair dryers, wireless internet, satellite TV, clock/radio, CD player, and toiletry items. 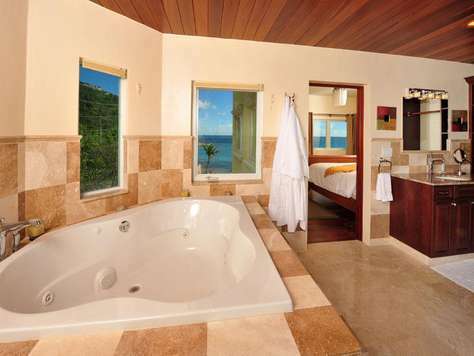 All suites are appointed in classic Caribbean furnishings of the highest quality. The Master, Leinster Bay, Trunk Bay and Coral Bay Suites all have king-sized beds and the Bordeaux Suite has a queen bed. 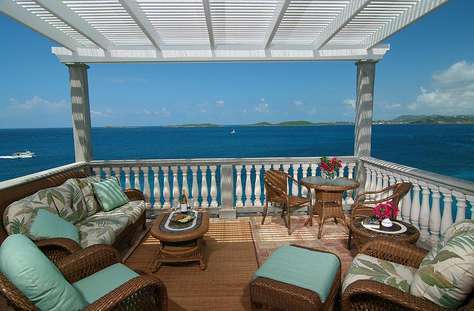 Each suite has its own private balcony with views to Tortola, Cinnamon Bay, Mary's Point and the British Virgin Islands. The Master Suite is an opulent retreat for the ultimate in vacation luxury. 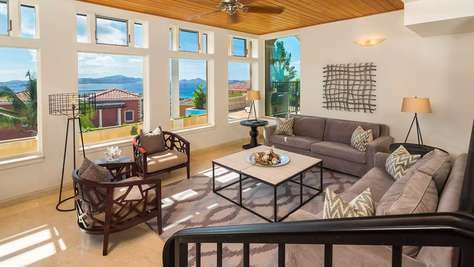 Views to Tortola, Mary's Point and Cinnamon Bay will greet your every morning from the balcony of your sumptuous suite located at the very top of Villa Delfina. 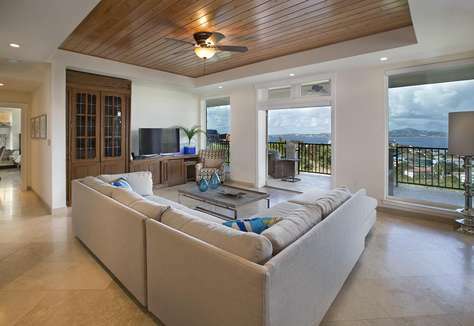 Hardwood floors, custom hand-made furnishings, onyx counters, tiled outdoor shower, large walk-in closet, vessel sinks, coffee/drink bar and a special tea-settee for that morning coffee or after-beach beverage, create an elegant ambiance not found in most Caribbean villas. The luxurious Trunk Bay Suite is located on the middle level and is accessed via the inside staircase which opens to the upper sitting area with flat-screen TV. This area is enclosed on three sides by stunning mahogany windows allowing a view to the back gardens. The bathroom includes an outdoor shower, robes, hair dryer, toiletries and a double sink. This Suite offers a beautiful island-style mahogany king-sized bed. The luxurious Leinster Bay Suite is located on the middle level and is accessed via the inside staircase which opens to the upper sitting area with flat-screen TV. This area is enclosed on three sides by stunning mahogany-framed windows allowing a view to the back gardens. The bathroom includes an outdoor shower, robes, hair dryer, toiletries and a double sink. This Suite offers a beautiful island-style mahogany king-sized bed. The luxurious Coral Bay Suite is located on the lower level, with access both from the inside stairwell as well as from the car court via the outer stairs in the back garden. 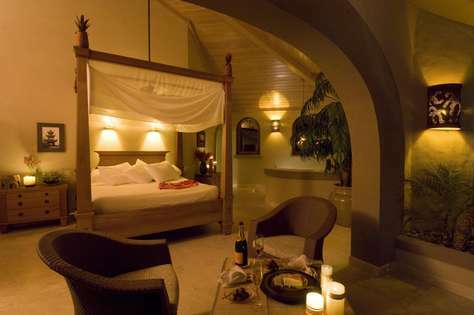 This private Suite is furnished in the coral colors of our beautiful reefs. A beautiful colonial style four-poster king-sized bed completes this fabulous room. The luxurious Bordeaux Mountain Suite is located on the lower level, with access both from the inside stairwell as well as from the car court via the outer stairs in the back garden. 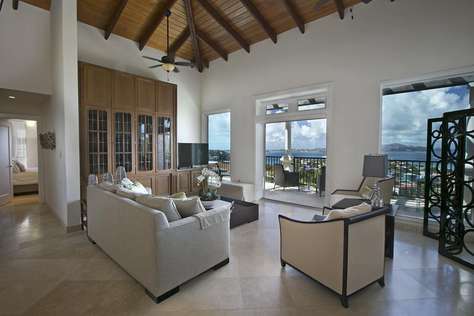 This private suite is furnished in the greens of our lush island. There is a beverage bar with coffee maker and mini-fridge. The bathroom includes an outdoor shower, robes, hair dryer, toiletries and a double sink. 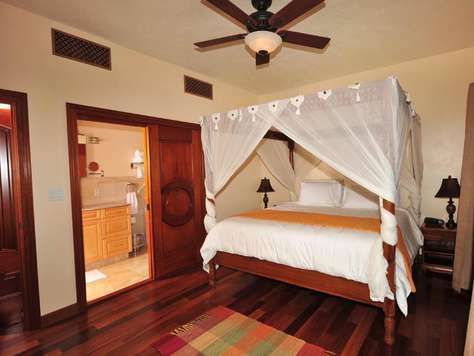 This Suite offers a beautiful hand-made mahogany island-style queen-sized bed. Surrounded by foliage and palms, Villa Rivendell is a 4BR/4.5BA luxury home that is perfect for your private vacation getaway. • Pool house terrace offers a pavilion with a wet bar, gas grill, ice-maker and refrigerator for poolside entertaining and dining. 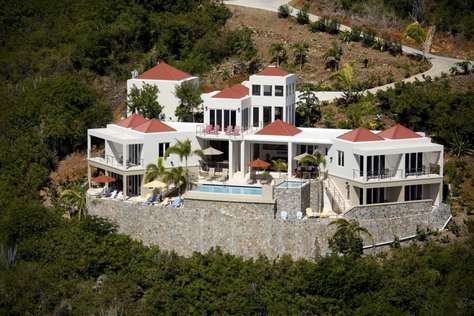 Come see why so many others have chosen Villa Rivendell as their Caribbean home away from home! 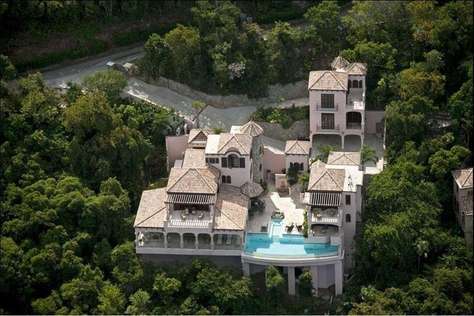 Perched majestically above the Caribbean in the gated enclave of Upper Peter bay is an elegant sanctuary, Villa Carlota. Designed and built thoughtfully and with great love by a family whose dream it was to create a showcase adorned with the art and antiquities collected through extensive worldwide travel. Arriving through the gated entrance your party is welcommed by masterful stone work in native coral stone and imported Italian marble, bubbling fountains, baroque sculpture, grace and beauty. Villa Carlota features five air-conditioned bedroom suites, each with master baths and amazing views from a private terrace. Additionally, a master chefs kitchen, expansive common area, breathtaking great room and dining suite, are all designed with relaxation, comfort and vacation-ease in mind. Though many of the local beaches are consistently ranked among the world's Top Ten Best Beaches, many guests to Villa Carlota tell us that they "never wanted to leave the pool." 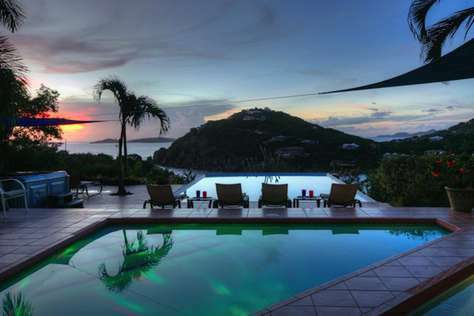 On St John USVI, there are many world class choices to be made, each offering it's own unique memory for both first time guests and returning STJ lovers, and Villa Carlota stands as an Icon of beauty and opulence above most. For this reason among many, guests continue to return year after year to our sancuary in Peter Bay. Villa Carlota is a liveable work of art! St. Thomas. Great Cruz Bay is where the Westin Resort is located. 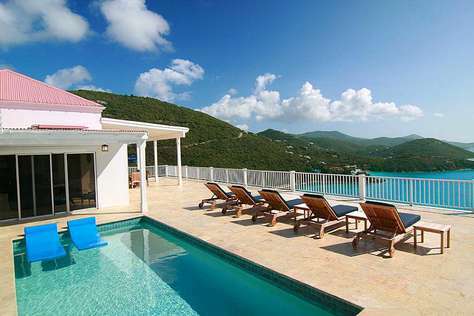 Villa Rhapsody St. John is a newly constructed villa as of June 2008.
out towards the beautiful Caribbean, sits poolside. 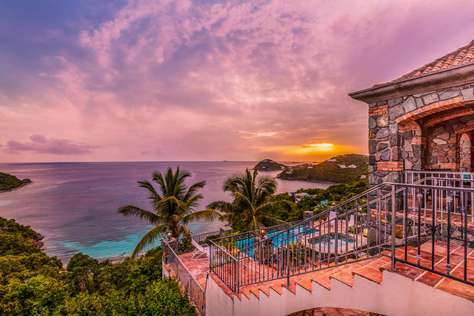 Unlike most St. John villas that are located high on the hills with distant ocean views, Villa Rhapsody St. John floats directly over the spectacular turquoise Caribbean - the ocean literally 50 feet below. By day, your view of yachts & sailing vessels of all sizes traveling from Cruz Bay to Great Cruz Bay and St. Thomas is soothing. 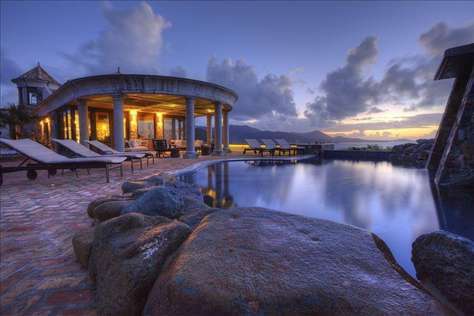 By evening, the fiery sunsets over the infinity pool with the twinkling lights of St. Thomas in the distance is majestic. The eternal sound of the surging ocean below you is your romantic soundtrack. This magnificent 5BR/5.5 bath villa sleeps up to 10 adults, plus additional beds for an additional 4 children accommodating a total of 14 (10 adults + 4 children). In the Rhapsody Great Room is a spacious living area, dining area, chef's kitchen, and small office area with high speed DSL. A state-of-the-art entertainment center & sound system with large screen HDTV is enjoyed in the Great Room living area. Outside of the Great Room is the breathtaking Rhapsody St. John lanai. 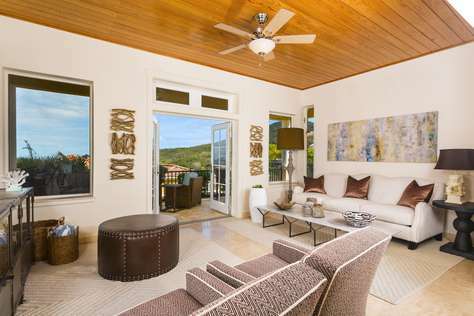 This exterior living area is Caribbean living at its best. Oceanfront & looking out towards St. Thomas & St. James islands, day or night, the views are grand. Whether for a romantic hideaway, or a festive special occasion, Villa Rhapsody St. John offers the spaciousness of a Caribbean estate with ultra luxury accommodations, a magnificent and romantic infinity pool and deck, a superb private setting - all floating above the turquoise Caribbean with the never ending surround sound of the ocean directly below you. Sleeps an additional 4 children. Please call for pricing. Additional 20% for Christmas/ New Year's/ President's Week. 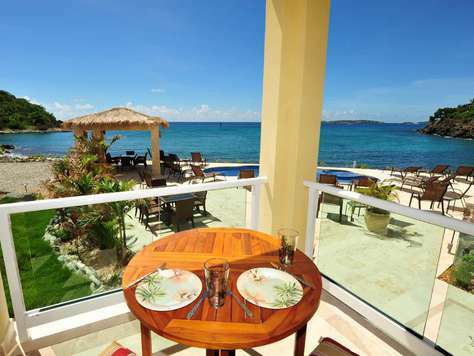 10% USVI Hotel tax and a 5% Service Fee Apply. An Estate such as A La Mer defies adequate description, as words cannot come close to capturing the reality of such a magnificent centerpiece. 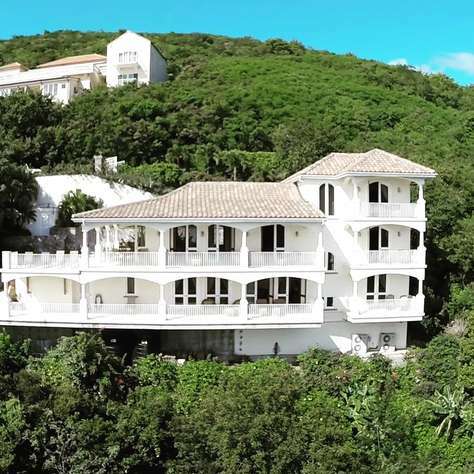 With nine bedrooms, nine full baths and over thirteen thousand masterfully planned square feet, A La Mer is perfect for up to twenty two guests, and is situated right on it's own private beach in beautiful Great Cruz Bay. The architectural layout of the villa is in two carefully planned tiers which make up the central hub of the estate, offering seven bedroom suites, a great room, gourmet kitchen, sprawling outdoor deck and fully equiped faux white sandy beach. Beyond that, a private cabana constructed of beautiful native stone by local master stone masons welcomes you and your guests to the expansive pool, which is guaranteed to awe. There is a water volleyball net, swim up bar and barstools, outdoor BBQ areas, lounging areas, gardens, and so much more! The detached A La Mer Cottage features two more bedrooms and is a perfect solution for those times when guests wish to experience peace and solitude away from the main group. For the snorkel and dive fans, there is world class diving available a short walk down the beach to the Westin. Featuring custom tile and stonework throughout, the finest furninshings of mahogany hard wood, beautiful art and so many unique features, A La Mer has become an instant favorite destination to each and every guest she welcomes and we invite you to experience the magic of a Caribbean island vacation through the lens of St John, and A La Mer. We look forward to welcomming you! 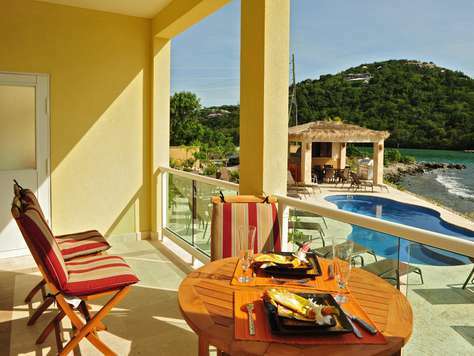 Aqua Gem is located just above the Westin Resort, overlooking the turquoise waters of Great Cruz Bay. 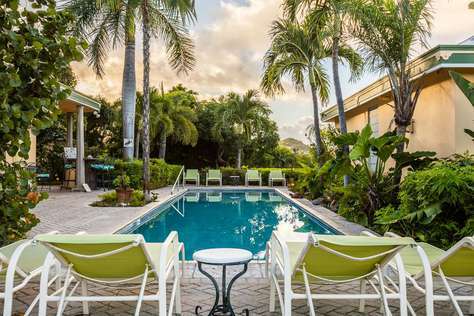 The house faces south-southwest and gets poolside sun all day. The picturesque view includes the islands of Little and Great St James and the south end of St. Thomas, plus the sparkling waters of Great Cruz Bay and the Caribbean, as well as views of fiery sunsets and distant island lights at night. This is a very convenient location that is less than a five minute drive to the restaurants, beach bars, groceries and shopping in the delightful town of Cruz Bay. You’re also only a 5-minute walk to the restaurants, spa, beach and taxi stand at the Westin Resort. Three sets of fully screened French doors open onto the upper deck that wraps around the south and west sides of the living areas. The fully tiled interior living areas are cooled by ceiling fans and ocean breezes and are furnished with a rattan and wicker couch, loveseat and chair, and Caribbean artwork and accessories. A 32’ flat screen TV/DVD, a stereo/cassette/CD and iPod dock, plus wireless internet and telephone are included. You may dine inside or on the upper deck at the wicker and glass table seating 4-6, or on the pool deck at the table seating 4. The kitchen is well equipped with a 4 burner gas stove and oven on an island bar/counter, a refrigerator, microwave, toaster oven, toaster, blender, and a gas grill on the deck. The 2 lower-level bedrooms (accessed by a spiral staircase or exterior stairs) are cooled by ceiling fans, the tradewinds and an efficient split level air conditioning. Both master bedrooms are equally sized with queen beds, tiled floors, a chest of drawers, lamp and end tables and a fully tiled bath and shower. Imagine sleeping late and rolling out of bed and into your pool, located a few feet from both bedrooms and accessed through screened sliding glass doors. 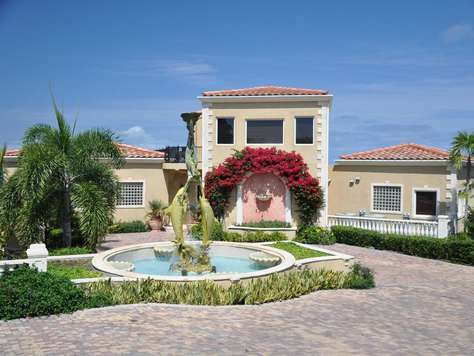 Tennis Villa is located in Great Cruz Bay in a very convenient and appealing setting. It's an exceptional spot that enjoys excellent privacy and peace and quiet, and yet it's a 3-4 minute walk to a white sand beach with swimming and boating in calm Caribbean waters at the Westin Resort. For dining options, it's an easy walk to a beach side restaurant/bar under swaying palms at the Westin or it's a 5 minute drive to the restaurants in Cruz Bay. 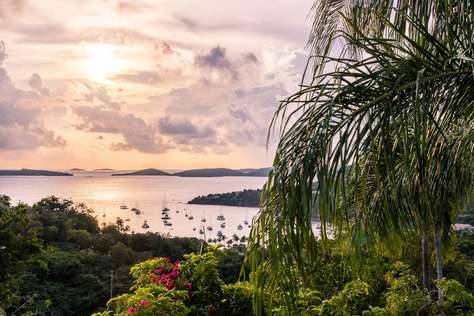 Tennis Villa sits on a large lot on the peninsula that separates Great Cruz Bay Harbor from Chocolate Hole Harbor, with picturesque views of both harbors. Both Great Cruz Bay and Chocolate Hole Harbor are well-established and desirable neighborhoods that consist of expensive residential villas. 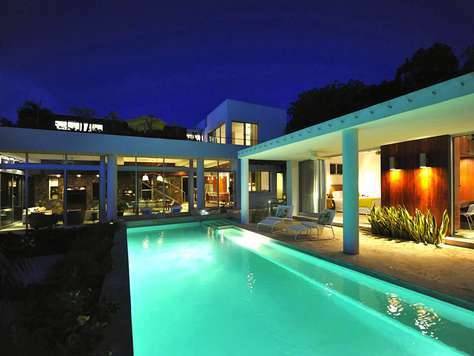 As with the location, the design of this graceful villa is also alluring. Completed in 1995, the one-story custom design is child friendly, spacious and comfortable. Only a few St. John villas combine this much space and privacy with such easy access to so many activities and amenities. Tennis Villa consists of a 3 bedroom/3 bath main house plus a 1 bedroom/1 bath detached pool house. The main house contains a truly gourmet kitchen plus the living and dining areas, while the pool house overlooks the all weather surface tennis court. The arched doorways of the living area of the great house flow into a large garden courtyard that encircles a 43- foot pool. The south-facing courtyard gets all day sun and affords privacy and sunset views. Rosebay sits about 110 feet above the harbor at Great Cruz Bay. 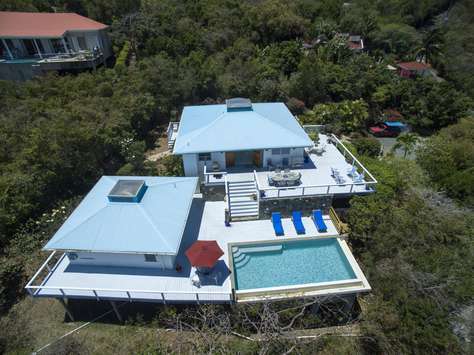 The house is surrounded by tropical vegetation in a luxuriant setting that offers charming tropical views, including the islands of Little St James, Capella, Great St. James, and the south end of St. Thomas, plus the sparkling blue-green waters of Great Cruz Bay and the Caribbean. This villa faces south and west so it gets plenty of sun, lovely colors at sunset, and the lights of distant islands twinkling at night. 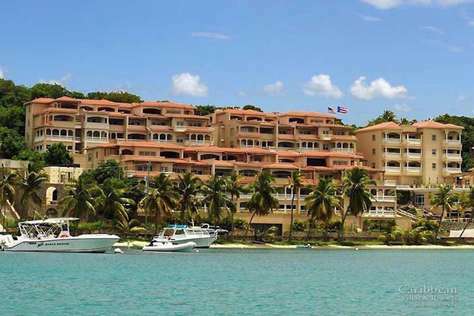 Rosebay is also very convenient - less than a 5-minute drive - to the restaurants and bars, groceries and shopping in the delightful town of Cruz Bay. Rosebay is a cozy and romantic 1 bedroom plus a loft, 1 bath, air conditioned home that sits in the midst of a colorful, well maintained tropical garden. You park below the house and a stairway leads up to an entrance into the great room. All the rooms except the loft bedroom are on one level. The great room is furnished in a lovely tropical manner with rattan furniture, terra cotta tiled floors, cathedral ceilings with ceiling fans, soft pastel colors and screened sliding glass doors. A screened in porch provides an excellent area to dine, relax in the hammock or sip drinks while watching the fabled Caribbean sunset. The master bedroom is off the great room and the small guest bedroom is located in the loft, accessed by interior stairs. The hot tub on the south deck is a good spot to enjoy a peaceful moment, surrounded by the sights, sounds and perfumed smells of the gardens. L'Esprit is a perfectly appointed, beautiful home with breathtaking views from every room, patio and even showers! • 4 large suites - king beds & on-suite bath! 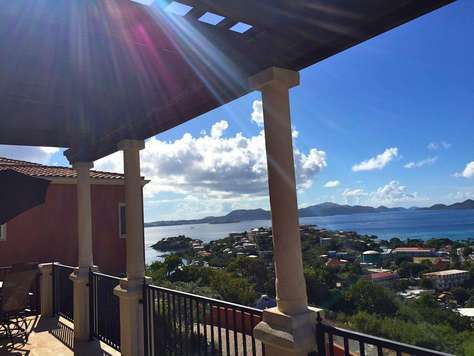 L’Esprit De La Vie is a spectacular Virgin Islands vacation retreat. 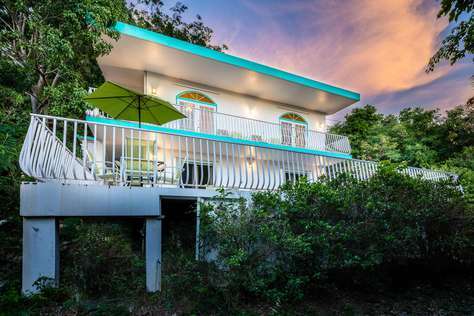 Caribe Villa on St John USVI is owned by America’s famous artist, Peter Max. 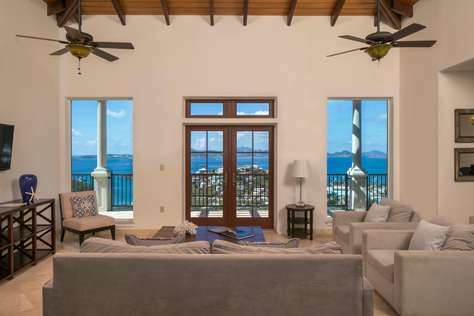 This impressive villa located on beautiful Boatman Point overlooking Klein Bay and Rendezvous Bay, and looks south to St Croix. The Great Room comfortably seats 10+ in front of a 50” flat screen TV and is great for family gatherings after dinner. Call for details on stays less than 7 nights. 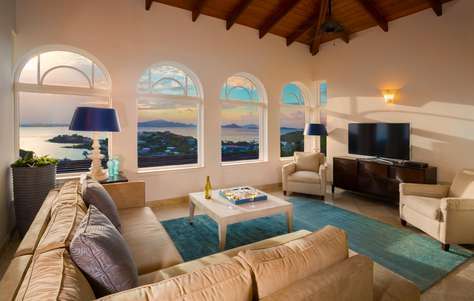 Villa Kalorama is one of St Johns most unique, modern, and new vacation villas on the Virgin Islands rental market, and is in a class of its own. 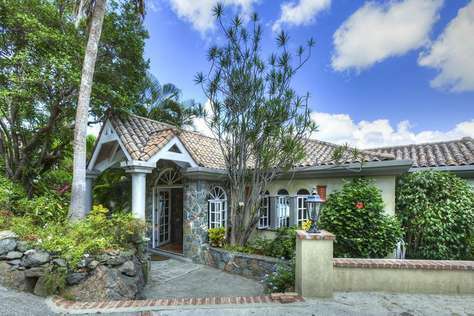 Kalorama is located in the upscale neighborhood of Virgin Grand Estates. This 5 bedroom villa (4 bedroom suites and a 5th bedroom with 2 twins that can be made into a king) has air-conditioned bedrooms with TV, DVD, Satellite Dish Service and private bathrooms for maximizing your comfort and privacy in each room. Kalorama has a 14 x 40 foot long pool and is 8 feet deep. The Great Room is 60ft long x 36ft wide with sliding glass sinking doors for maximizing views day or night. For entertaining Kalorama is equipped with iPod connection to speakers and a 47inch flat screen TV. The upper veranda is 22ft wide x 40ft long and is perfect for entertaining during the sunset hours. 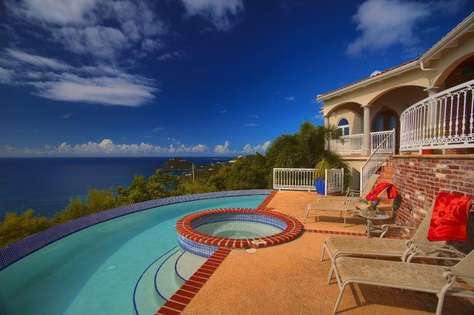 Villa Rapture is located in exclusive Virgin Grand Estates, 600 feet above sea level with commanding views of St. John’s South Shore. The villa’s covered outside living room is just steps from the pool and deck that enjoys sunshine and the tropical trade winds all day long. This newly constructed villa is perfect for families or traveling couples, with the interior spaces located on two levels, with two suites upstairs, and two more suites and a day bed with trundle in game room (downstairs). A large, formal great room includes a 51 inch television monitor. The open kitchen includes top end appliances, and a nearby dining area seats 10. 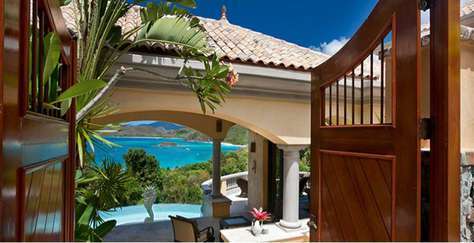 This villa is available for St. John destination weddings and other special celebrations, up to 50 guests. 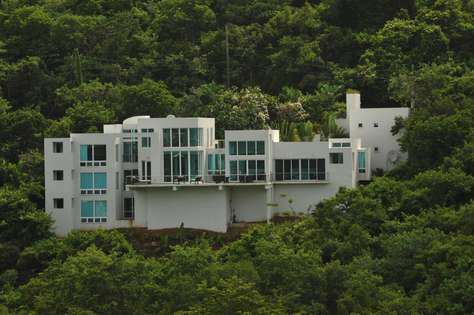 Casa De Sonadores sits high on a St John island hillside more than 500 feet above sea level in popular Virgin Grand Estates. Casa de Sonadores is a fully air conditioned, beautiful Mediterranean style St,. John villa built of island stone and concrete finished in coral stone tile flooring (inside and outside) and granite counters is the perfect villa for your vacation. This 4 bedroom suite villa is spacious and private for large groups and private for indulging in your favorite book on one the veranda off one of the private bedrooms. The patio area is inviting for all if you want to maximize your sunning or just cool off in the shade and still enjoy the views until long after sunset. The BBQ area and outdoor dining table for all occasions is surrounded by lush tropical colorful gardens and views from north west, to St Thomas to west and southwest. The latest addition to Casa de Sonadores is a media game room on the lower level of the villa. Fill out this form and an agent will get in touch and help you find the perfect VI rental for your vacation!